Unearned revenue, or sometimes referred to as deferred revenueDeferred RevenueDeferred revenue is generated when a company receives payment for goods and/or services that it has not yet earned. In accrual accounting, revenue is only recognized when it is earned. If a customer pays for good/services in advance, the company does not record any revenue on its income statement and instead records a, is the payment received by a company from its customers for products or services that will be delivered at some point in the future. The term is used in accrual accountingAccrualIn financial accounting or accrual accounting, accruals refer to the recording of revenues that a company may make, but it has yet to receive, or the expenses that it may incur on credit, but it has yet to pay. In simple terms, it is the adjustment of accumulated debts and credits. Such accounting practices, therefore, in which revenue is recognized only when the payment is received by a company while the products or services are delivered to a customer. Some examples of unearned revenues include advanced rent payments, annual subscriptions for a software license, and prepaid insurance. The recognition of unearned revenue is quite common for insurance companies and software as a service (SaaS) companies. Image from Amazon Balance Sheet – Check out CFI’s Advanced Financial Modeling & Valuation Course for an in-depth valuation of Amazon. Accounting reporting principles state that unearned revenue is a liability of a company. The rationale behind it is that despite the company receiving payment from a customer, it still owes the delivery of a product or service. If a company fails to deliver the promised product or service or a customer cancels the order, the company will owe the money paid by the customer. Therefore, unearned revenue must be recognized as a liability. Note that when the delivery of goods or services is complete, the unearned revenue recognized previously is recorded as revenue (i.e., the unearned revenue is actually earned). 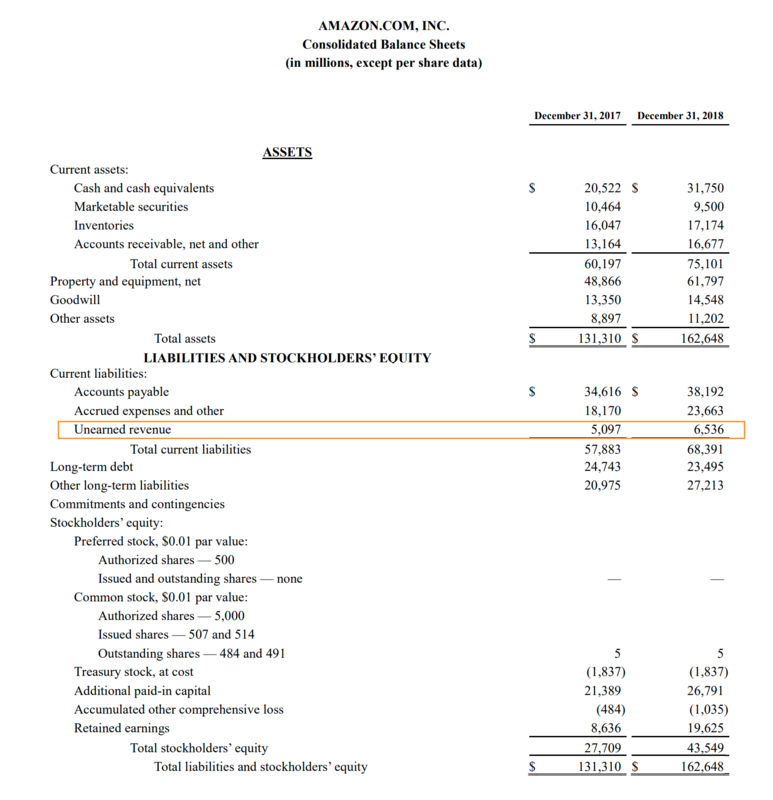 Unlike revenue, unearned revenue is recorded on the company’s balance sheet under the liabilities section. Generally, unearned revenues are classified as short-term liabilitiesCurrent LiabilitiesCurrent liabilities are financial obligations of a business entity that are due and payable within a year. A company shows these on the balance sheet. A liability occurs when a company has undergone a transaction that has generated an expectation for a future outflow of cash or other economic resources. because the obligations are typically fulfilled within a period of less than a year. However, in some cases, when the delivery of the goods or services may take more than a year, the respective unearned revenue may be recognized as a long-term liability. Fred is an avid user of Amazon.com’s services. Recently, he discovered about Amazon Prime services. Fred wants to enjoy the benefits of the service, such as free two-day shipping and access to unlimited music streaming and buys the annual subscription for $79. For Amazon, Fred’s payment ($79) is the unearned revenue since the company receives the full payment in advance while none of the services have been provided to Fred yet. Initially, the full amount will be recognized as unearned revenue on Amazon’s balance sheetBalance SheetThe balance sheet is one of the three fundamental financial statements. These statements are key to both financial modeling and accounting. The balance sheet displays the company’s total assets, and how these assets are financed, through either debt or equity. Assets = Liabilities + Equity. However, at the end of the first month, the monthly portion of the total amount ($79/12=$6.58) will be deducted from the unearned revenue figure and recorded as the company’s revenue. The similar procedure will be repeated each subsequent month until the end of the 12th month when the last portion of the payment will be recognized as revenue.